The first pictures I formed of New Orleans came from Anne Rice. Like thousands of other teenagers, I devoured Interview with the Vampire in both its novel and film variations. 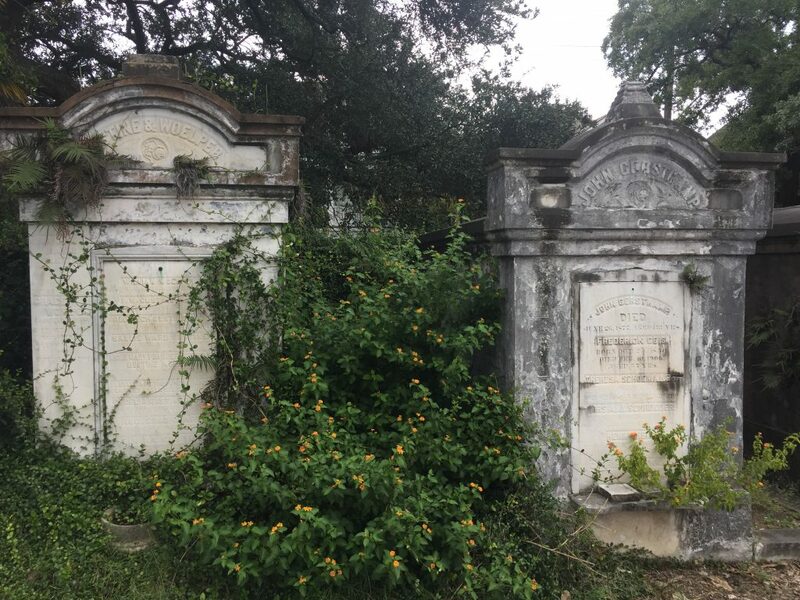 In my imaginings, the images of New Orleans came through vampire eyes – a place dark and romantic, full of strange and slightly threatening beauty. And like Rice’s vampire protagonists, I came to New Orleans hungry. I feasted on cafe au lait, boudine hash, scrambled eggs, and biscuits topped with cane syrup. 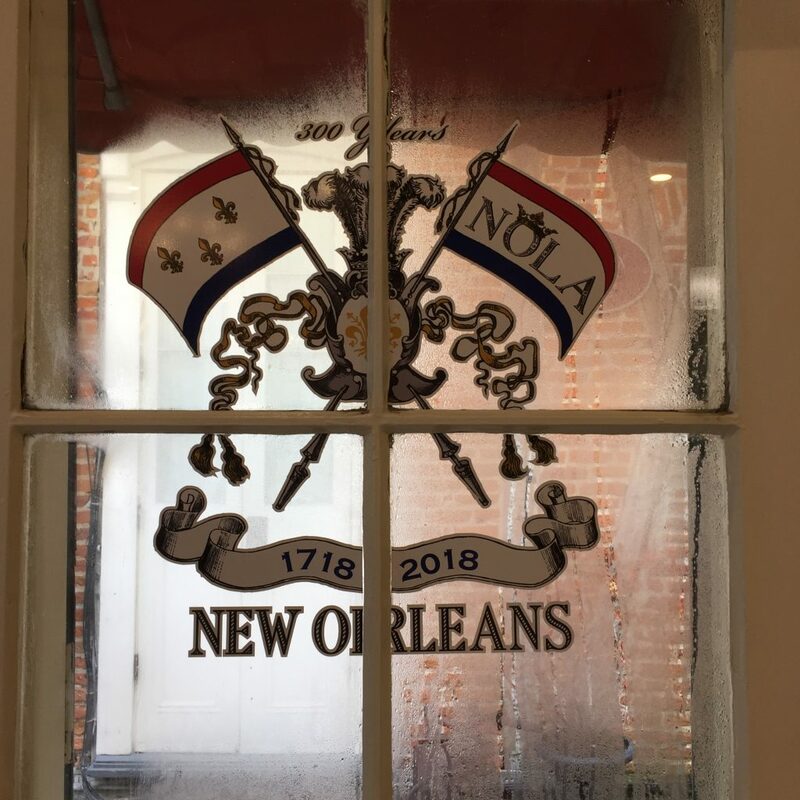 An inconvenient headcold prevented me from sampling any of New Orlean’s alcohol or legendary nightlife, but I did indulge on the pleasures of food. Gumbo file. Chunks of alligator meat seasoned with Cajun spices. Shrimp (of course). Red beans and rice (of course). Obligatory beignets from Cafe du Monde. I ate like a tourist. And I ate well. But I came to New Orleans for more than food. In this I was not disappointed. 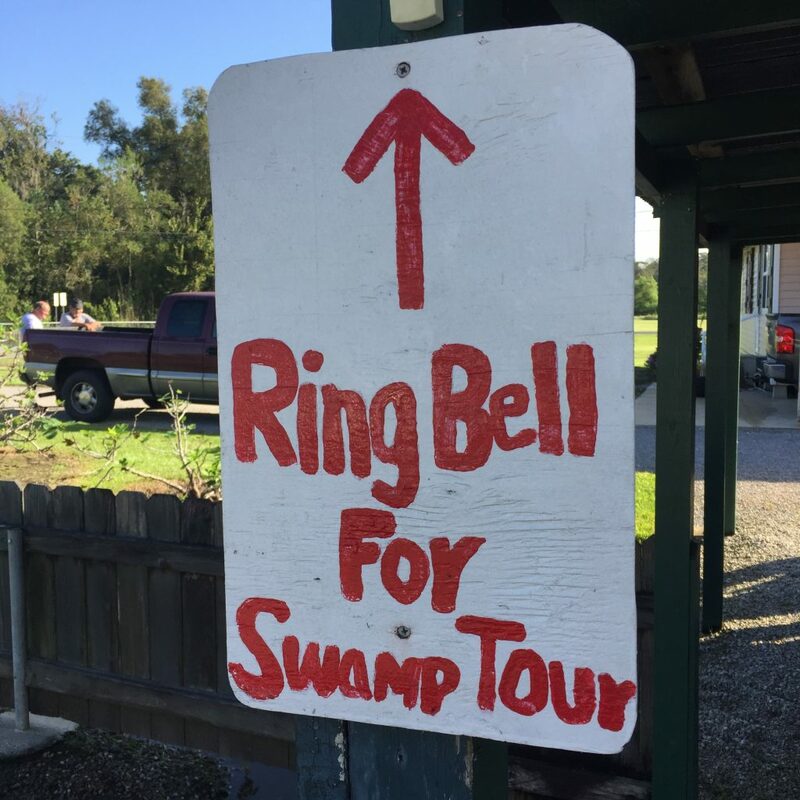 I visited the bayous and watched as our guide lured alligators from the brown swampwater with a few tossed marshmallows. 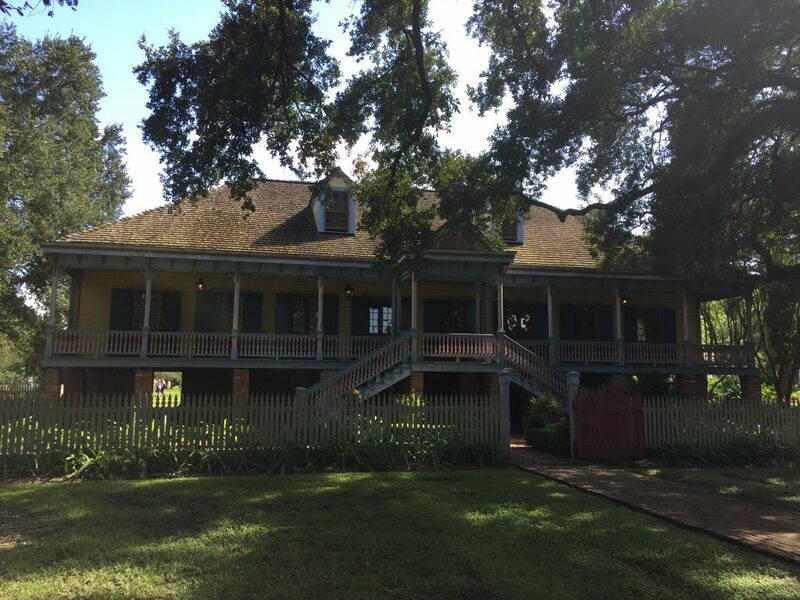 I toured stunning plantations, included the fabled Oak Alley (used in the film Interview with the Vampire, and set cinematically alight by Brad Pitt), and listened as guides spoke of both the Creole families who lived in those mansions and the slave families that built them. I sloshed through Bourbon Street one night in the rain, the refuse of a thousand indiscretions detectable on the breeze, and in the water rising around my ankles. I spent nearly a full day at the World War II museum, lost in time and feeling shaken from my vantage point of having been born well after its conclusion. Certainty, I learned, is a gift that comes only in hindsight. Perhaps inevitably for a city that has built its recent reputation on hedonistic pleasures, much of New Orleans is predictably tacky. Hordes of intoxicated tourists roam the thoroughfares, some of them pushing strollers. Shops sell T-shirts with lewd slogans, and beads and bottles of hot sauce are everywhere. Window in the French Quarter. Still, there is something mysterious under the surface. Despite modernity, the city is still defined by its geography. The river. The levees. The heat. Nature cannot be escaped, and must be tolerated. 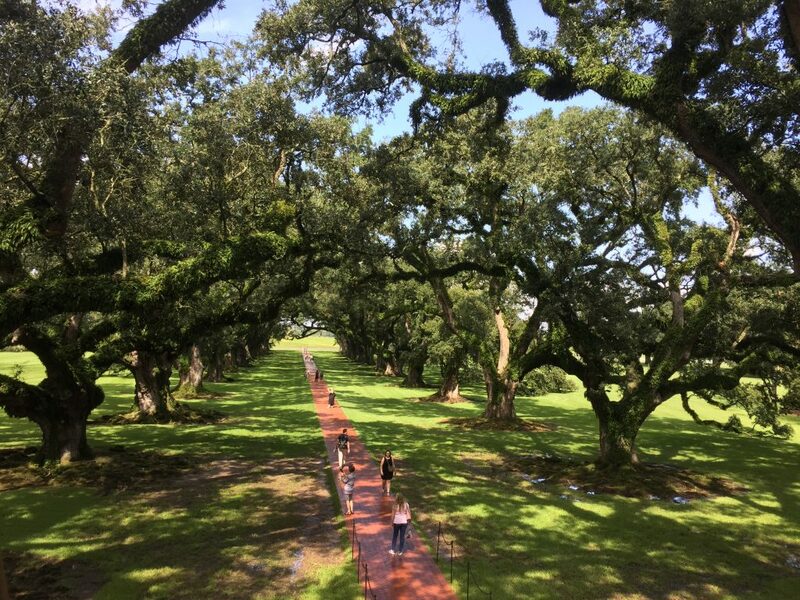 Even in October, vines and blossoms flourished, and trees grew thick with Spanish moss. I caught glimpses of the pastel mansions in the Garden District as the streetcar rolled past. The sides were open, allowing in a rush of humid air. I stepped off and soon reached the gates of one of the Lafayette Cemeteries. A black crow fluttered in one of the treetops. It would have been ominous were it not so perfectly times. I walked among the grounds, weeds and grass poking through the crumbling pathways. The mausoleums are overrun with plants as if even stone and concrete can decay. 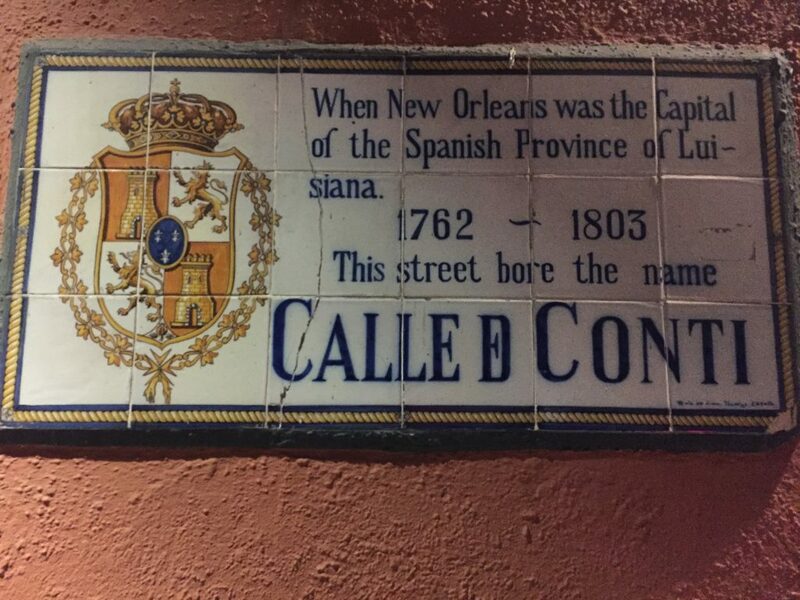 In the 300th year since its founding, New Orleans was a reminder that America was not always American. The land was a battlefield for European empires, and home to millions of native inhabitants. 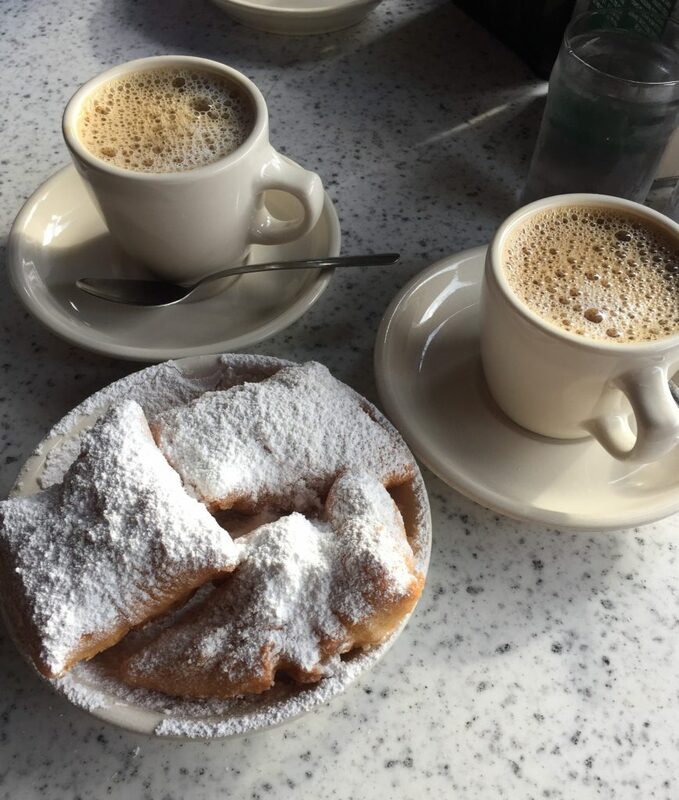 New Orleans, after all, had been French. And before that, Spanish. And before that, the Chitimacha tribe farmed, fished, and hunted along the waters leading to Lake Pontchartrain. On my first night in the city, music and shouts from the street brought me to my hotel room window. Looking down, I saw what first appeared to be a parade. But on second glance, the figures were recognizable as a wedding party. The bride and groom led the way, followed by their guests and a second line that created a joyful procession through the street. 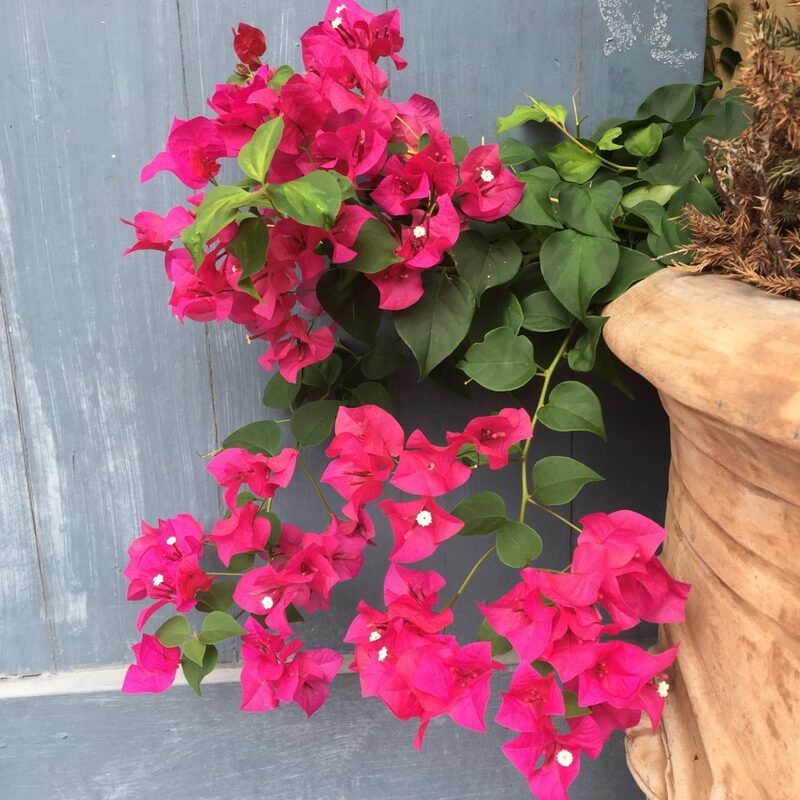 And during my last meal, I heard music again – horns and drums that grew louder and louder until they literally passed by the window I was sitting beneath, and established themselves in the restaurant’s back room. It was a funeral, and in true New Orleans style, it sounded like a hell of a party. Three years ago, my backyard hens laid their first eggs. To commemorate the occasion (and because I get a lot of questions about the hens) here are some words on backyard chickens. Raising chickens was not my idea. They arrived in my life after I made a passing comment to my husband that having backyard poultry might be “interesting.” Not long after, I came home to discover eight day-old peeps cheeping under a heat lamp in the laundry room. 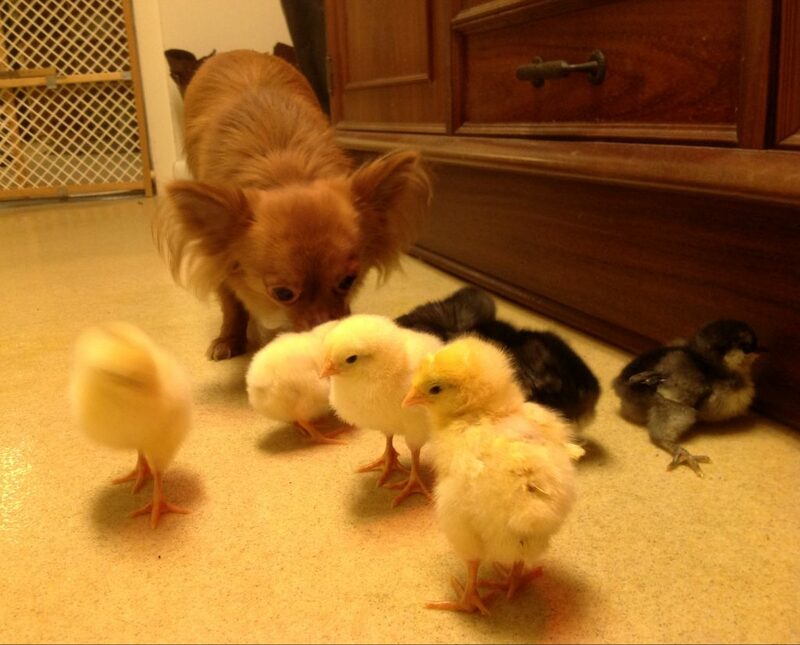 Our chihuahua Taco herding the baby peeps. Meanwhile, my husband worked on a contractor-grade outdoor coop that would become the chickens permanent home. It had a working window, tile flooring (for easier cleaning), built-in next boxes and roost, and an insulated roof. The thing took four months to build and countless trips to Lowes’. One afternoon mid-build the chickens escaped from their brooder and ran amok in our sunroom. I arrived home from work to discover the chickens perching atop my graduate school thesis and family photos, feathers and poop everywhere, cheerfully oblivious to the mayhem they caused. 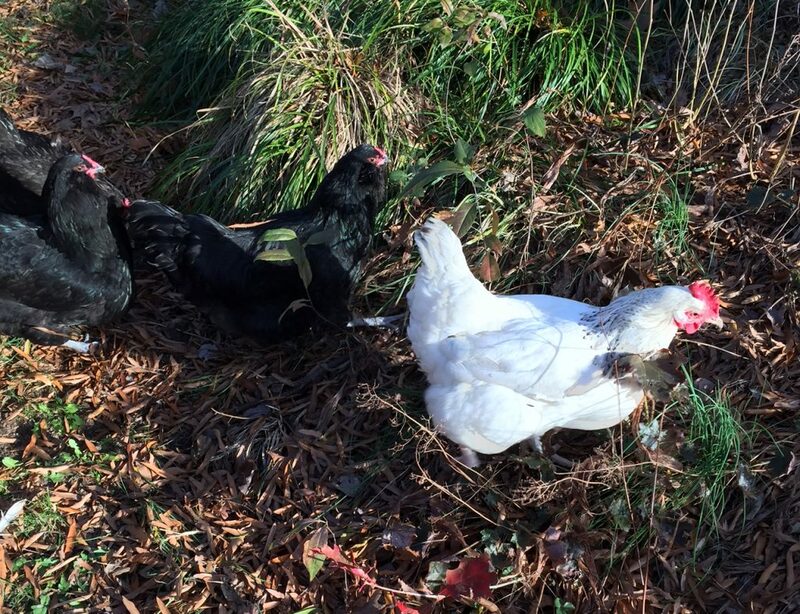 Our chicken experiment nearly ended then and there – via an impromptu and immediate chicken pot pie – but reason intervened and we captured the wayward chickens and returned them to the brooder. Soon after, they moved to their outdoor quarters, where they have remained ever since. Eggs from our backyard hens. Chickens are messy. Not only do they poop a lot and shed feathers, they also shed a fine white dander. That alone is enough for me to refrain from treating them as cuddly pets – though some chicken owners feel otherwise (see this fascinating article on a CDC advisory telling owners to stop hugging their chickens). Chickens have personality. The pecking order is real! We have the boss hen, Sophia, who pushes the other hens around. She’s first in line for the food and will peck the others back into their places. Newcomer Alice was shy at first but hung in there for the #2 spot, with the twin Americuana hens Matilda and Myrtle deferring to their more aggressive companions. Chicken psychology is real. Like people, chickens can be upset by changes in their environment or stressful circumstances. For instance, food or water shortages will cause the hens to stop laying, as will being frightened by predators like foxes. Myrtle has a propensity for “broodiness” (stubbornly sitting in the nest box when there are no eggs to hatch; this can be dangerous as broody hens often don’t get enough food and water because they insist on sitting in the nest.) When we place Myrtle in a special coop to break her broody cycle, the other hens tend to not lay as well. Chickens get you close to your food. It is thrilling to see fresh eggs! 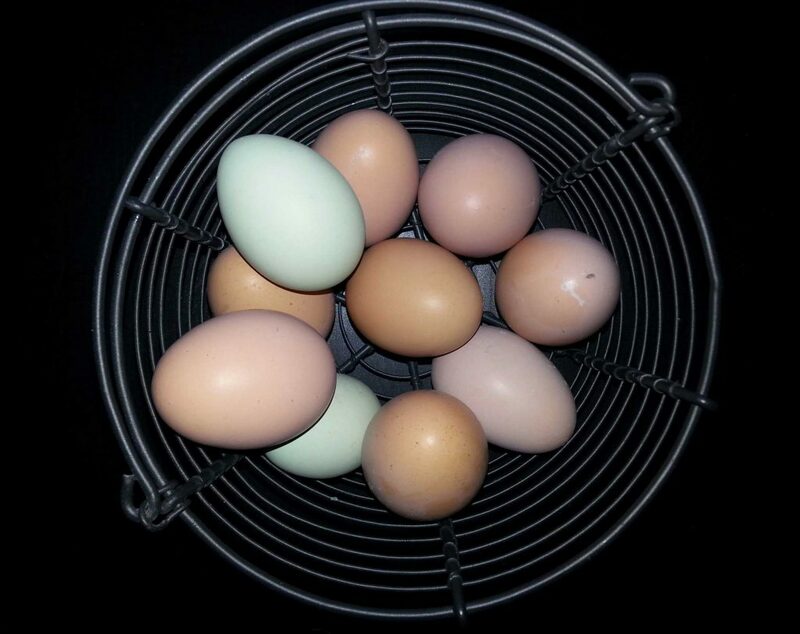 Because our hens lay eggs in different colors and shapes, we are often able to tell whose egg it is. We originally had four roosters from that set of 8 chicks; we aren’t able to keep roosters, so one by one, we harvested and ate them. This may sound cruel, but it actuality it is only removing the commercial poultry farms and butchery from the equation. It seems a more honest way to eat meat. Chickens are great for “going green.” Between our compost piles, chickens, and recycling, we have very little actual trash. Chickens are excellent means of using food scraps that might otherwise be thrown away. Vegetable peels, stale breads and rolls, strawberry hulls, apple cores…chickens love it all! These scraps add variety and extra nutrition to their diet of commercial poultry feed, and it reduces our food waste. It is pretty amazing to think that I know every single thing those chickens have eaten since they were a day old! Also, we are able to raise the chickens in comfortable, more natural circumstances and in a far more humane way that is generally practiced in commercial poultry operations. Sophia and the flock hunting for bugs. The chickens are not saving us money when it comes to food or providing an endless supply of fresh eggs (production dwindles as the chickens age as well as with the seasons – in fall and winter, we may only get an egg a week), but they have been a worthwhile experiment, and a source of endless dinner party conversation. Got a chicken question? Ask in the comments and I’ll do my best to answer! Every summer I engage in a ritual. It’s not the beach, a family reunion, or a camping trip (although I do those too). I make jam. 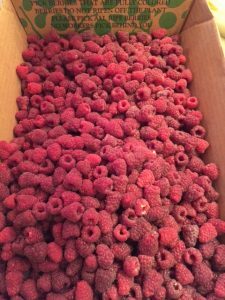 If I can get to the woods, I harvest wild berries. Otherwise, I pick them at a local farm. Then I lug my haul home, boil up a pot of water, and begin kitchen alchemy. 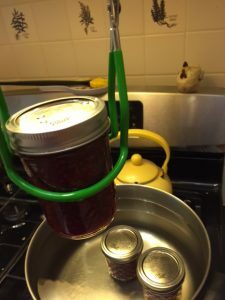 There are plenty of easier ways to get jam, so why the fuss and bother of home canning? Partly, it’s about having a skill that seems less and less common. Partly it’s about honing my self-reliance. But the main thing is, and has always been, about the food. Americans love to watch television shows about food, but we often forego cooking, as outlets from the Washington Post to Forbes to Slate have noted. 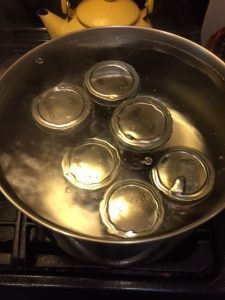 With glass jars, boiling water, and the careful chemistry of heat, sugar, and fruit, the canning process is both reminiscent of a science experiment and a visceral confrontation with the elements. It’s dangerous. It’s inconvenient. And it forces you to get close to your food. 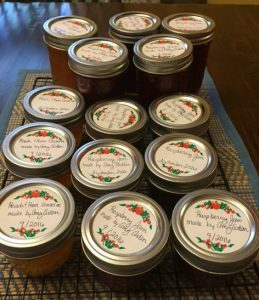 As a result, the jam is not simply purchased, but earned. Wash 1 quart of red raspberries. Crush berries in a large bowl. 3. 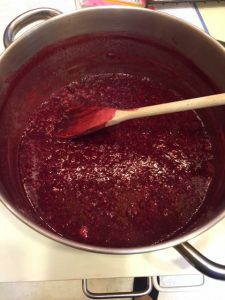 Combine berries with 6 ½ cups of sugar in a large saucepan. Bring to a boil and stir until the sugar dissolves. 4. Stir in 1 pouch of Ball Liquid Pectin (available at supermarkets). Boil hard 1 minute, stirring occasionally. 6. Place the clean jar lids onto the filled jars and adjust the rings. Careful, as the jars will be hot. Return the filled jars to the pot of boiling water. Process for 10 minutes. 7. Remove the jars with the tongs. Place on a wire rack. You will hear the lids “pop” as the jars seal. I generally let the jars cool for 24 hours, by which time all the lids should have sealed. Next to travel, food is my other great love, so its no surprise that my writing often turns to cooking, eating, and recipe-collecting. Last week I was lucky enough to combine both in a quick jaunt over the border to Toronto. Ok, it wasn’t so quick. We spend 11 hours in the car, conveniently divided by a stopover in Pennsylvania. But Toronto is a great city for people who like to eat. Our first night there, we went to Little Italy and gorged on homemade pancetta, pasta, osso bucco, and red wine. After that, we had to stop into one of the neighborhood’s numerous gelato shops for dessert. The next morning, we were off to the St. Lawrence Market for a famous peameal bacon sandwich and hot coffee. Delicious! Thus fortified, we set off for the Toronto Islands and spent a lovely afternoon nattering around on bicycles, soaking up sunlight along the shores of Lake Ontario, and finding quaint little cafes for lunch. Come dinnertime, we were back at the market buying up sweet corn, fresh asparagus, basmati rice, a few bottles of a local vintage, and $5 bacon-wrapped filet mignon (Seriously? Canada, I love you.) We then cooked up our feast surreptitiously on my friend Lori’s grill. Lori, if you noticed anything amiss, that was us. Back home on the ranch, we’ve been taking a far more pragmatic approach to food. We’re eating what has been raised, caught, or foraging either by ourselves, or someone we know. Case in point: one of the backyard chickens that had been “harvested” was transformed into a pot of adobo con pollo. It has been the most successful preparation of a backyard chicken so far. It actually tasted like chicken, and overall was pleasant enough that we could stomach leftovers the next day. But these birds, even at the tender age of 5 months, are chewier than a bran muffin composed of wood fibers. Next up was some halibut, caught in Alaska by relatives and shipped to us in dry ice. I’ve never cooked halibut before, but thanks to this recipe, we grilled those filets up and had a blast messing around with the accompanying herbal pistou. I didn’t even bother with the walnut butter. Anything that requires fennel pollen is just a little too precious for this gal. Finally, the foraging. Just like Willoughby and his wildflowers in Sense and Sensibility, I acquired some blackberries from an obliging field. * These were duly baked into a cake, which will be consumed momentarily. There is something very satisfying about food that is acquired through effort, and not just dollars spent at a grocery store. If I’m honest with myself, my efforts at this point don’t amount to much more than dilettantism. But my curiosity has been piqued. A subscription to Organic Farming may not be far off in the future. * The neighbor’s yard. But they weren’t using them. In March, I got ambitious in the kitchen and decided to make a Downton Abbey-inspired dinner. It was great fun! Last month, by request, I gathered some of my girlfriends together for another night of haute cuisine. Or, as haute as you’re going to get with an amateur cook in the suburbs. As before, I visited the wonderful Downton Abbey Cooks blog for inspiration. For a summer menu, I wanted cool, complimentary flavors that were light, seasonal, and filling. Also served with chardonnay, or a lovely wine from South Africa that one of the guests brought! All went swimmingly! The guests arrived, I got to use my fancy wedding china for the place settings, and we moved through the first three courses with alacrity. I had no reserve supplies in the larder, or an army of servants to put together an impromptu picnic. But I did have a grill. And charcoal. I lit the coals, pulled the still-warm chicken from the oven, butterflied the meat, popped the root vegetables into a separate pan, and began to grill, baby, grill. It was unconventional, but it worked. Dinner was saved. True, it was a trifle later than I would have liked, but it was far better than ordering Chinese take-out. I was grateful that the ladies went along with my plan! I’m not sure if I would have had the courage to try this with anything other than old friends. Tonight, I’m feeling just crazy enough to make homemade ice cream and a chile-honey glazed salmon. Because once you’ve grilled a chicken in a cocktail dress, you’re ready for just about any kitchen challenge. During the winter months, I have to mostly content myself with dreaming of Western adventures. Until my next travels towards the sunset, I have been working on a couple of articles about cool frontier stuff like ghost towns and the Oregon Trail. I’ve dabbled in learning to ride English, and watched a whole lot of Downton Abbey. As a finale for Season 3, I decided to indulge in a Downton Abbey tribute dinner, inspired by Canadian food historian Pamela Foster’s totally awesome blog, Downton Abbey Cooks. First, I was in love with the names of the dishes alone. Simply saying “oysters a la Russe” aloud sent little shivers down my spine. Explaining that I was making a “champagne-saffron vinaigrette” to my mother, who was duly impressed, made the weekend feel 10 times more elegant, even as I went off to the supermarket that morning in sneakers and sweats to pick up my ingredients. Secondly, although I had chosen dishes that were relatively simple and didn’t require a lot of hands-on time, and although I was only cooking for myself and my husband, doing a multi-course meal is exhausting. I cannot imagine how Mrs. Patmore would have cooked for an entire family, and their guests (and probably a lot of the servants) night after night, without any electric appliances and no modern refrigeration. By the time dinner was actually on the table, I was feeling a bit done in. I still went upstairs and put on a fancy dress, because at Downton (even make-believe Downton), dressing for dinner is the right thing to do. As far as the food itself, it turned out far better than I would have imagined. The oysters were a combination of Outer Banks and Chesapeake Bay oysters, and the rich flavors of the tomatoes and pepper made a very savory combination. Although the Sancerre was just a touch sweet, overall it went fairly well with the dish. And since the Loire Valley has been a wine-producing region for ages, we felt it was in the spirit of Downton to go with a French vintage for this course. We really should have had another wine for the asparagus salad, but we stuck with the Sancerre as there was still plenty in the bottle. The saffron flavor was very subtle, but the color combinations of this dish made it quite pretty to look at. It may also have been the healthiest thing on the menu! Now, the chicken. Quite simply, this is the best roast chicken recipe I’ve seen, hands down. The meat came out very moist and flavorful, and perfectly cooked after an hour and 45 minutes. I put herbs and butter AND lemon slices on and inside the chicken, and boy, it did the trick. I realize that serving a red, American vintage was a bit of an unusual choice for poultry, but there was a lot of white wine being served at other points in the meal, and I wanted something a bit earthy. Secondly, the Philip Carter winery is old, like 1762 old. In fact, the wines were awarded a Royal Society medal in the late 1700s. Maybe its a bit of a stretch that the Downton cellars would have included a New World vintage, but not impossible. And if they did, I suppose there are worse options than a Virginia-grown blend of Cabernet Franc, Petit Verdot, Cabernet Sauvignon, and Merlot. The apple charlotte was also a pleasant surprise. This was my first go-round making this dessert, and I decided to fancy up the recipe a bit. Apparently cinnamon was not used widely around the WWI era, but I threw in a few dashes of nutmeg to liven things up. Preheat oven to 350 degrees F. Combine the nutmeg and white sugar in a bowl. Stir the sugar mixture and the apples together. Place a layer of buttered bread in the bottom of a pie plate, buttered side down. You may need to use partial slices of bread to cover the plate completely. Add two layers of apple slices. Sprinkle a portion of the brown sugar on top. Add a layer of buttered bread, and more apple slices, covering the bread completely. Sprinkle again with brown sugar. Bake for 45 minutes. Allow to cool slightly. Meanwhile, beat the heavy cream until stiff peaks form. Top individual servings of the apple charlotte with freshly whipped cream – and a little nutmeg, if desired. Serve at once. The end result? I’m not quitting my day job for culinary school anytime soon, but it was a tremendously fun experiment. Maybe I’ll kick Season 4 off with a special “downstairs” menu in honor of the folks who really keep Downton going. I embarrassed myself plenty taking food pictures, and felt like I was on some kind of diet plan that required recording everything I ate. One of the best things about traveling is the chance to eat a lot of funky (and hopefully delicious) food. These are a few of the highlight meals. There were plenty of un-highlights as well – way too many fast food burgers, an immoderate amount of trail mix, and even one of those Backpacker’s Pantry meals that you cook in pouch with boiling water and of course never really progresses beyond the lukewarm stage of rehydration. From Foundation Grounds Coffeehouse, St. Louis, MO. Yum! That’s my sister on the other side of the table. Schoepf’s Old Time Pit BBQ serves it up old-style off of I-35 in Belton, TX. Chop beef, pork, sausages, and more, plus plenty of sides and a back porch that seems to cover at least a couple of acres. You can bet that’s sweet tea in the glass. This French toast and the accompanying coffee did much to restore body and soul after a late night on 6th Street. I asked for extra cherries and got them, and the bourbon-cream sauce was out of this world. From The Old Pecan Street Cafe in Austin, TX. 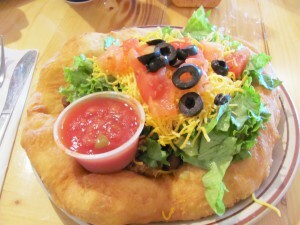 I also had “The Best Indian Taco in the West” outside the Little Bighorn battlefield and quite possibly the best coffee ever from Beta Coffee in Cody, WY (no picture or website, but I got a sweatshirt.) It was a robust blend of flavor and caffeine that was the perfect way to start the day. Maybe I could have spent more time analyzing the subtlety of the flavors, but I was too busy enjoying it.